A statement supporting Kirsan Ilyumzhinov’s candidacy for FIDE Presidency issued by Afghanistan Chess Federation was received by Ilyumzhinov in Moscow. 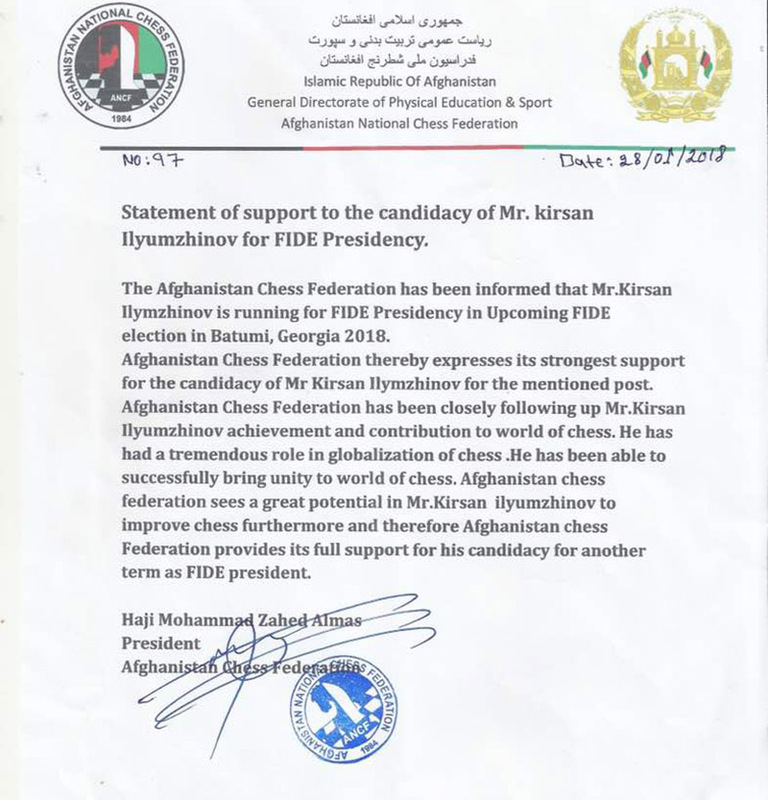 The statement reads in part: "The Afghanistan Chess Federation has been informed that Kirsan Ilyumzhinov is running for FIDE Presidency in upcoming FIDE election in Batumi, Georgia 2018. Afghanistan Chess Federation thereby expresses its strongest support for the candidacy of Mr Kirsan Ilyumzhinov for the mentioned post. Afghanistan Chess Federation has been closely following Kirsan Ilyumzhinov achievement and contribution to world chess. He has had a tremendous role in globalization of chess. He has been able to successfully bring unity to world of chess. Afghanistan Chess Federation sees a great potential in Mr Kirsan Ilyumzhinov to improve chess furthermore and therefore Afghanistan Chess Federation provides its full support for his candidacy for another term as FIDE President".